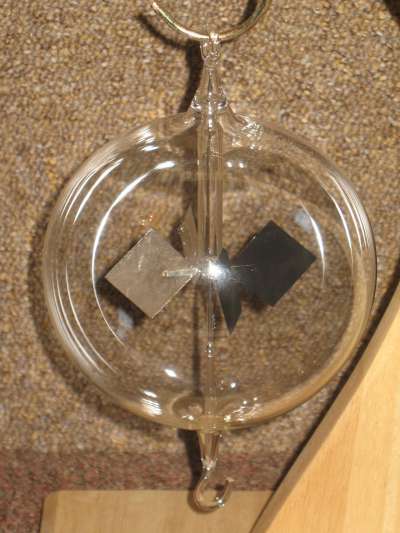 This is a Crookes radiometer. It demonstrates the kinetic energy of photons. The "engine" consists of four vanes mounted on a low friction rotor. Each vane is coloured black on one side and silver on the other. The whole is mounted in a sealed glass globe. 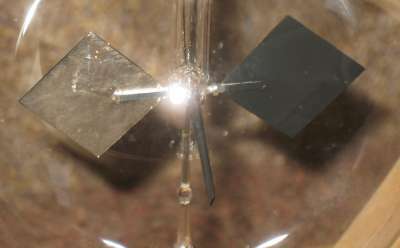 When strong light, or any other electromagnetic radiation, strikes the black sides, it is absorbed and the photons' energy is transfered to the vane. Radiation that strikes the silver side is reflected and does not transfer it's energy. This results in the vanes rotating. The radiometer is in the form of a sealed glass globe, 110 mm diameter containing the rotor, which is suspended on a needle bearing. I'm not sure if the globe is evacuated or not; probably not. The globe has a loop at the top to enable it to be hung on a chain or cord. There is a hook on the bottom which serves no obvious purpose but could be used to hang other lightweight devices or decoration.